Dwyer Aluminum Mast Company- Manufacturers of Quality Sailboat Masts, Booms, Hardware and Rigging Since 1963. Dimensions: 2.63 in. x 3.25 in. Complete boom quoted on request. See measuring for more information. To order boom extrusions, please specify the quantity and tube length. If a sailfeed is desired, please check the box below. See measuring for helpful information. You will have an opportunity to enter any special instructions during the checkout process. (ex. 29 ft. 10.25 in.) ft. in. Check here to include sailfeed. A $20.00 charge will be added. use (2) SSP4 pop rivets. 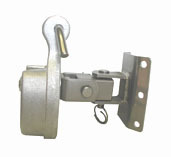 Shown with optional tack pin, DH2152.